Mission Santa Clara. Courtesy of Santa Barbara Mission Archive-Library. Mission Santa Clara de Asís, number eight in the chain, and founded on January 12, 1777, lies adjacent to the oldest college in California, the University of Santa Clara. It is here that Father Serra broke tradition, choosing the first woman to serve as patron saint, St. Clare of Assisi, who founded the Poor Clares order of nuns. Like many in the mission chain, Mission Santa Clara has suffered from its share of flooding, earthquakes and fires. Originally built alongside the Guadalupe River, a flood made the mission’s location inadvisable. An interim site was used with a more permanent third location blessed by Father Serra on November 19, 1781. An 1818 earthquake severely damaged the mission, resulting a temporary adobe church near the present site. After secularization the building was purchased by the university and razed in 1867. Construction began on the fifth and final site in 1822. However, a 1926 fire ravaged through Mission Santa Clara, causing the church to be remodeled for a final time. Only this adobe wall and lodge remain after the fire. The present church is bright and grand. The façade returned to its original one-tower design, embellished with carved wooden status of the saints. Interior walls were painted in pastel pink and blue and careful copies were made of the destroyed reredos and Augustin Dávila’s painted ceiling. The mission bell tower uses four bells, cast in 1798, 1799, 1805, and one in 1929, a gift from Spain’s King Alfonso XIII. This cross contains pieces of Mission Santa Clara’s original cross, which stood outside the previous five churches. 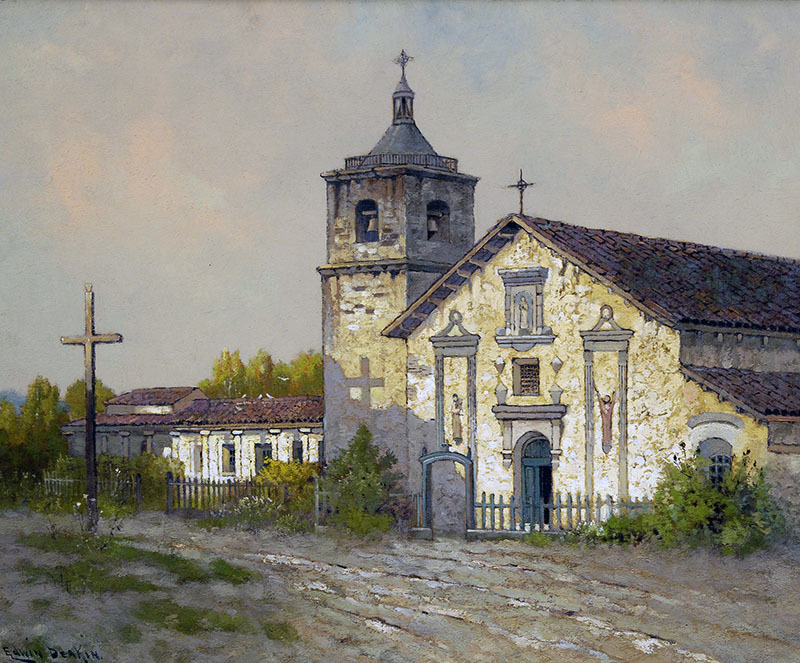 One of the last churches to be secularized, Mission Santa Clara experienced a period of US occupation, before the land was given to a Jesuit order and transformed into a university campus. This school, Santa Clara University, was founded in 1851. From US-101: Exit onto US-880 toward Santa Cruz/Los Gatos. Exit to the right onto CA-82 (The Alameda). Turn left into the main entrance of Santa Clara University. The mission is in the center of the campus. Please call 408-554-4023 for information. Note that Catholic Mass is celebrated Monday-Friday in the mission chuch at 12:05p and on Sundays at 10a, 6p, and 9p. Please call 408-554-4023 for information.